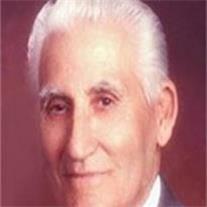 Charles Lawrence (Larry) Zufelt, 91, passed away peacefully January 21, 2013 at his home in Mesa. He was born on April 18, 1921 in Jewett, New Mexico to Charles and Dolly May DeLuche Zufelt. Larry served a mission in South Carolina for the LDS Church. Following his mission, he served two years in the U.S. Navy, was honorably discharged in 1946 and started his own concrete block plant in Durango, Colorado. He married Anna Jacqueline (Jacque) Waddell on April 2, 1948 in the Mesa, Arizona LDS Temple, and settled in Gallup, New Mexico, and operated his own block company. Larry and his family moved to Mesa, Arizona, and he took a job as a salesman for Superlite Block during the day, and worked nights and weekends to establish his own masonry business and invested in real estate and rental properties. Larry loved being busy and always had another project to work on. Larry lived a life of service to his family and church, and together with Jacque, his wife of 65 years, served a Church mission in Ft. Lauderdale, Florida, and in the Arizona Temple for 30+ years. He loved his Savior and had a passion for teaching the Gospel at every opportunity, and his testimony and example will be remembered by all who knew him. Larry was one of the most generous, selfless, patient and forgiving people, and had a way about him that made others want to be like him. His grandchildren were the light of his life and he always looked forward to family gatherings when he could be around them. He is survived by his wife, Anna Jacqueline (Jacque) Zufelt; children: Larry W. Zufelt, Pamela (Mark) Rowley, Cheryl (Martin) Howey, Debbie Clark-Zufelt, 28 grandchildren, 64 great-grandchildren and sister Stella Sawyer. He was preceded in death by his parents and 12 brothers and sisters. Funeral services will be held on Monday, January 28th at 11:00 AM at the LDS Mountain Vista Ward, 10305 E. Southern in Mesa, Arizona, with a viewing at 10:00 AM that same morning. There will also be a viewing on Sunday, January 27th from 6 to 8 PM at Bunker’s Garden Chapel, 33 North Centennial Way in Mesa. Interment will be at Mountain View Memorial Gardens, 7900 E. Main St. in Mesa, AZ.